In 1946, America had just exited the biggest war in modern history and was about to enter another of a kind no one had fought before. We think of this moment as the brilliant start of America Triumphant, in world politics and economics. But the reality is murkier: 1946 brought tension between industry and labor, political disunity, bad veteran morale, housing crises, inflation, a Soviet menace-all shadowed by an indecisiveness that would plague decision makers who would waffle between engagement and isolation, as the country itself pivoted between prosperity and retrenchment, through the rest of the century. 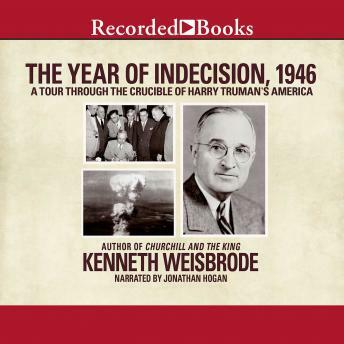 The Year of Indecision, 1946 overturns the image of Truman as a can-do leader-1946, in fact, marked a nadir in his troubled presidency. Relations broke down with the Soviet Union, and nearly did with the British. The United States suffered shortages and strikes of a magnitude it had not seen in years. In November 1946, the Democrats lost both houses of Congress. The tension between fear and optimism expressed itself too in popular culture. Americans rejoiced in talent and creative energy, but a shift was brewing: Bing Crosby making room for Bill Haley and B.B. King; John Wayne for Montgomery Clift. That year also saw a burst of spirit in literature, music, art and film-beneath the shadow of noir. The issues and tensions we face today echo those of seven decades ago. As we observe in this portrait of the era just before our own, as America learned, piecemeal and reluctantly, to act like a world power, it tried, and succeeded only partially, to master fear. Indecision, Weisbrode argues, is the leitmotif of American history.